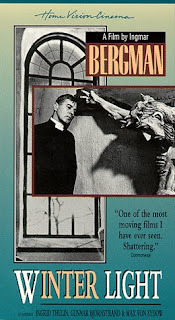 Ingmar Bergman is considered by many to be the greatest filmmaker ever. And Bergman considered Winter Light his favorite of his films. All that makes me feel inadequate to critique the film. Fortunately, my job here isn't to critique the film, but rather the church and the clergy in the film. Gunnar Björnstrand plays a Lutheran pastor, Thomas Ericcson, in a small town in Bergman's native Sweden. As the film opens, Ericcson is leading the congregation in a communion service. The subtitles are all familiar as he recites the words of Jesus ("Do this in remembrance of Me") and blesses thin wafers decorated with a crucifix. He leads the congregation in the Lord's Prayer, then distributes the Bread and the Cup as people approach the short white railing surrounding the altar. (As the cup is given to one person and then another, there is no wiping of the cup with a cloth.) The congregation sings "O Lamb of God" from the hymnal, accompanied by the organist (who we see checking his pocket watch). The church is small, and there aren't many pews; still the sparse congregation keeps their distance from one another. One little girl plays with her teddy bear out of boredom and licks the pew ahead of her with apparently the same motivation. Excepting perhaps one older woman, no one in the congregation communicates any sense of joy at being in this place, at this time -- the pastor in his grim black robe least of all. 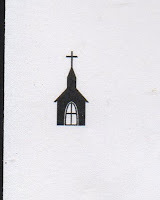 The pastor sends the congregation from the plain brick building with its stained glass and plentiful crucifixes with a blessing of God's grace and peace that is not apparent in his own glum face or voice. After the service, we see the pastor with another man counting the meager coins from the offering. The church handyman approaches with a question, which the pastor answers sharply and coldly. A pregnant woman and her husband, Jonas (played by Max von Sydow) approach the pastor. She says her husband would like to talk to the pastor about his depression and fears. Jonas says he heard a radio broadcast saying China was getting the atomic bomb, and he can't stop thinking about it. The pastor responds that "everyone feels this dread to some extent, but we must trust in God. I understand your anguish; God seems remote, and we feel helpless." Pastor Ericcson agrees to meet with Jonas later in the day, since Jonas and his wife must return home to their other two children. The pastor's housekeeper (who is a local school teacher and has also been the pastor's lover) asks what's wrong, and he responds, "God's silence." When the pastor meets with Jonas, they first talk about boats and boat makers. He asks about Jonas' finances. "So" he says, "It all boils down to the business with China." The pastor then launches into a long diatribe about how his wife died four years ago, and he then lost hope; though he started to lose faith in God with Spanish Civil War. He knew nothing of evil when he graduated from seminary. "I lived with God in a world where everything made sense." His seminary must not have gotten around to Job and the one or two ugly instances of battle and treachery in the Old Testament. Ericcson continues this counseling session with a suicidal man by saying, "I'm no good as a clergyman. I'm an ignorant, obnoxious, wretched clergyman. And my God is a spider God, but I tried to shield and protect my God. But if there is no God, would it make a difference? Yes, life would become understandable. There is no Creator, no Sustainer of Life, no design!" He leaves Jonas with these cheerful words. Once the pastor thinks he is alone, he says, "God, why have you forsaken me? Now I'm free, free at last! I had a fleeting hope everything wouldn't turn out to be illusions, dreams and lies." Though he has this great epiphany, he apparently goes on with plans to lead an afternoon service. Because, you know, a pastor's got to eat, even if he thinks he's just teaching lies. Ericcson learns that Jonas shot himself in the head and has died, in spite of the pastor's super job counseling with him. In fact, when Ericcson tells Jonas' wife of the tragedy, he says, "There's really nothing to do in some of these cases." He asks the wife if she would like to read Scripture with him, but doesn't offer a hand, an embrace or warmth of any kind. She refuses the Scripture. The film concludes with the pastor leading a worship service that no one seems to attend. You should, by all means, attend the movie. But I would never want to attend the church in this movie with its 1 steeple rating.